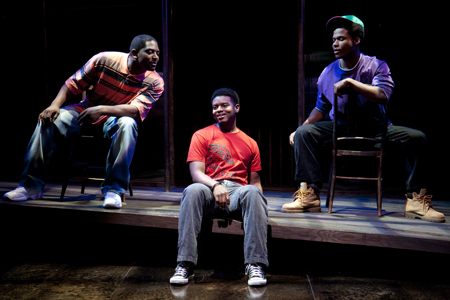 (l to r) Lance Coadie Williams, J. Mal McCree, and Nickolas Vaughan in "Marcus; or the Secret of Sweet" at The Studio Theatre. Directed by Timothy Douglas. Photo: Scott Suchman. Rain patters down plastic sheeting, as a man all in ghostly white speaks to a sleeping boy. He needs a message delivered to the living, on the eve of a dangerous storm that will change them all. It’s this eerie image that begins the final play in Tarrell Alvin McCraney’s Brother/Sister Plays, described by him as “inspired by Yoruba life and traditions, steeped in Southern rhythms and cadences, and seamed shut with the fire of urban music and dance.” If you’ve seen the other two in the cycle – The Brothers Size (2008) and In the Red and Brown Water (2010), you’ll probably know who the man in white is and what he needs. I hadn’t seen either, but that didn’t impact my enjoyment of Marcus; Or the Secret of Sweet. Playing now through February 13 at the Studio Theatre, the play is set in fictional San Pere, Louisiana on the eve of Hurricane Katrina, and though the storm is never mentioned by name its presence saturates everything. Teenager Marcus Eshu (a vibrant J. Mal McCree) is trying hard to discover the meaning of his dream’s message and untangle his own sexuality without alienating his best friends. Above all – stay out of danger, avoid his mother’s wrath and become a man in the process. He’ll have to work fast, as that rain approaches. (l to r) Shannon A.L. Dorsey and J. Mal McCree in "Marcus; or the Secret of Sweet" at The Studio Theatre. Directed by Timothy Douglas. Photo: Scott Suchman. There’s a lot of mythology in McCraney’s work – the central idea of Marcus is after all the classic Greek quest of seeking your father to find yourself. He’s a rising artist with a definite poetical voice. The first thing you may notice here (after that gorgeous rain effect by set designer Daniel Conway) is the characters speaking their stage directions. At first it seems a gimmick as they switch from direct addresss (“Marcus shrugs”) and back again, but after a few minutes it settles into the rhythm of the play and encourages the audience to be pulled into the action. We’re part of that world as well, and the audience the night I saw the play reacted more because of it – it was like being given permission to join in. Marcus is plagued by dreams of a man he can’t remember, and it’s his quest to find out that secret and the secret of self that drives the play. Spurred by the funeral of his best friend’s father, he begins to ask the uncomfortable questions we all do at 16: who I am? what are my elders really like? do I want boys or girls? There pretty much is no mystery to that last one for Marcus, as we see early on in a steamy fantasy sequence where the boys at school flirt with him to get test answers. Certainly everyone around him seems to know he’s “sweet” – adults and peers alike. With the sad exception of the lovestruck Osha (Rachael Holmes), everybody but Marcus seems to have made up their minds. It takes a mysterious outsider, Shua (Lance Coadie Williams in a langorous turn), to make up his. Though some themes are awkwardly introduced (the repetition early on of everyone calling Marcus “sweet” pretty much beat its inevitability into your head), overall the play’s conceits are beautiful – the blend of mythology and urbanism, the slow unfolding of the past and how it haunts the present. Though you can probably see the big reveal from a mile off (of course there’s a love triangle! though McCraney does resolve it humorously), it didn’t spoil it for me. Director Timothy Douglas keeps the action tight and the characters strongly delineated, though the physical space isn’t too clearly defined when the characters are running off to the Bayou or hanging out in the community center (and indicating how hot it is, never a good thing). But what resonates with me still are the characters’ voices, extremely well done by the ensemble cast. 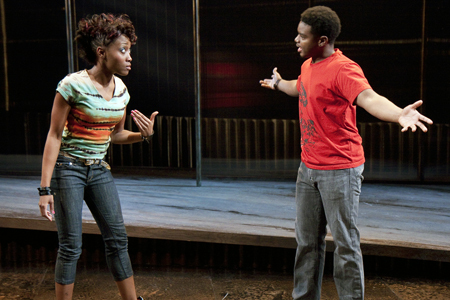 I wish now I’d seen the previous two plays in the cycle to see how some of the older characters came to be where they are now – the fury of Bianca LaVerne Jones’s Oba, or the sorrow of Montae Russell’s Ogun Size. Those actors are rooted in their pasts, and it gives the play a depth beyond a teenager’s quest. But then again, that quest is made urgent and real by McCree’s Marcus and his interaction with his best friend Shaunta Iyun (Shannon A.L. Dorsey). Their lively exchanges were my favorite moments. Shaunta’s explanation of how the word “sweet” came to be slang for “gay” – slaves found together were whipped, their wounds coated in sugar to draw insects and infection in the hot sun – made real both the threat of a secret’s exposure and the agony of ancestors’ past. Dorsey herself was the real stand-out of this production for me – hysterically funny, fast and furious. Secrets of the mind, dreams, your family, your blood. Coming of age in a place soon to be drenched in chaos. It’s heady stuff, made more powerful by humor. True to life. Marcus; Or the Secret of Sweet playing now through February 13. The Studio Theatre is located at 1501 14th Street NW, Washington DC 20005. Closest Metro Stop: McPherson Square (Orange/Blue Lines), U Street/Cardozo/African American Civil War Memorial (Yellow/Green Lines). For more information call 202-332-3300. I saw the first play in the cycle and enjoyed it, but I missed the second. I’m looking forward to this one. Studio has a great season this year.